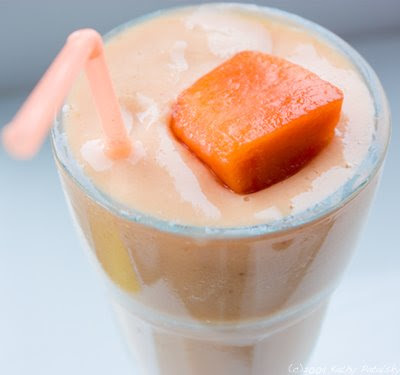 Peach Papaya Smoothie. Creamy. Light and Dreamy. 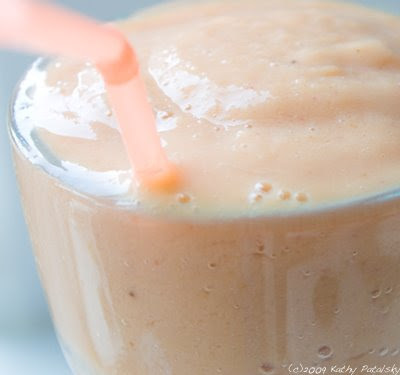 Add liquids, yogurt, frozen fruit and ice. Leave out a bit of the liquid to add slowly mid blend. Notes: It is optional to add 1 tsp of agave. Using a ripe banana will aide in sweetness. 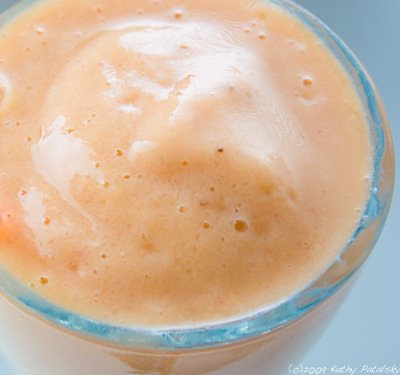 *Adding the whole yogurt container will make your smoothie creamier rather than frosty and thick. *Adjust the liquids to get your ideal thickness consistency. 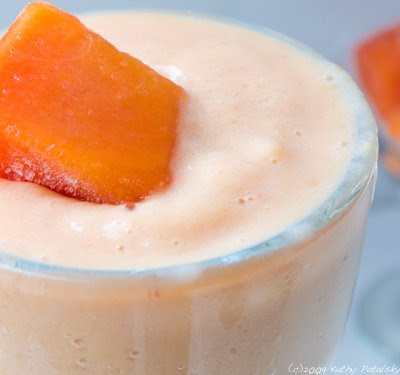 *Frozen peaches can also be added to this smoothie in place of or in addition to the strawberries. 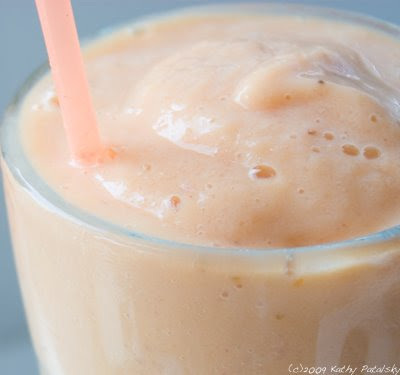 * If using a raw banana, add it at the end of the blending. *If using a frozen banana, let it thaw just a tad so it is not rock hard. *optional ingredients: shredded raw coconut, wheat germ, spirulina powder, raw almonds. 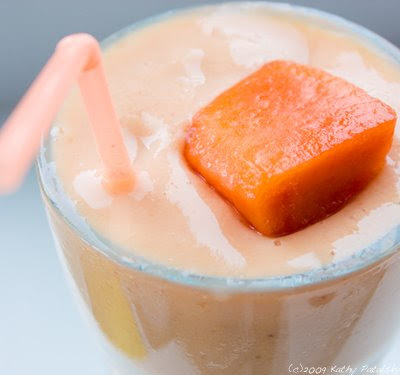 *Since frozen papaya and strawberries are both only about 50 calories per cup, this is a light and diet-friendly smoothie. 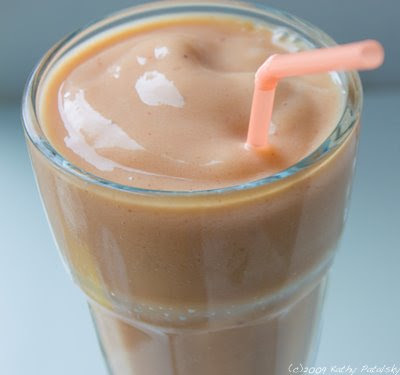 Make it lighter by adding unsweetened or plain yogurt and/or light soy milk and remove the fruit juice. 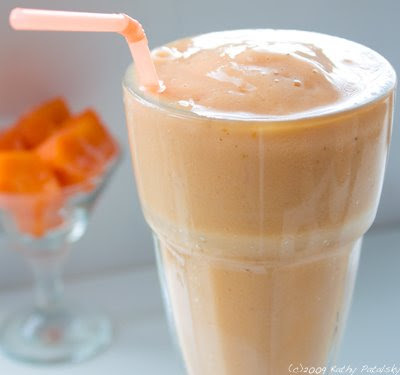 However, as is, this smoothie is high in nutrients and packed with healthy foods. *Add some green super food powder or spirulina powder for an extra nutrition kick. The color will change, but the taste won't if you use a high quality brand of green food.